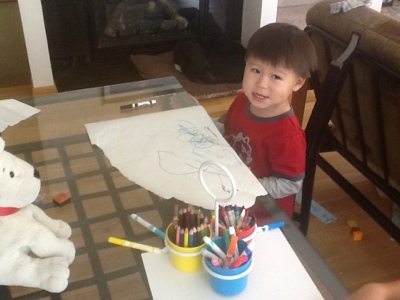 Domestic Engineering | Sewing, cooking, crafting…oh, and watching the kids. My life at home. We live right by a Dollar Tree these days, and I found baskets and decorate-it-yourself mugs there, plus some cellophane bags. I made granola similar to this, but with pecans, orange zest, and craisins, to make it a “holiday granola”. 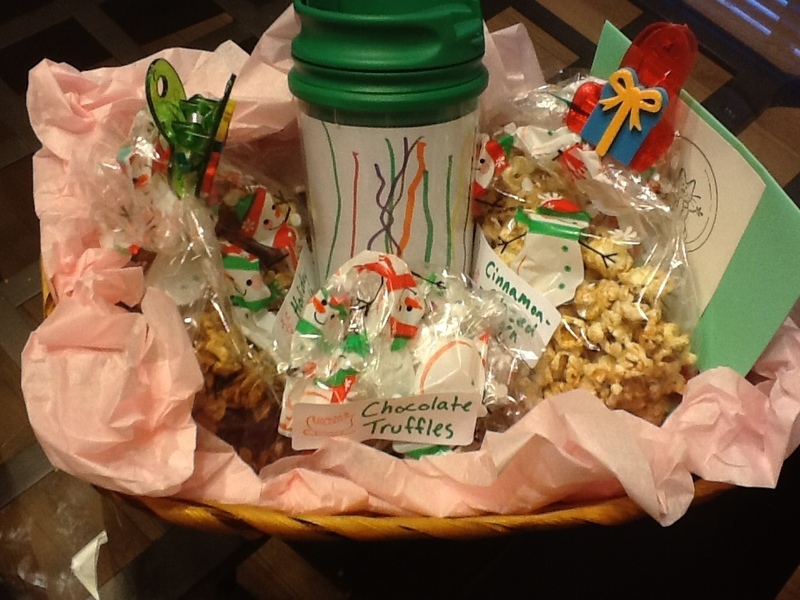 Then I made cinnamon-glazed popcorn, just as written, and chocolate truffles from a cookbook. They were simple but messy…so, so, so messy. In the end, the kids didn’t help at all because they are both sick, which is a bummer. Well, off to round up library books, package more bags of popcorn, do laundry…and pay more attention to LB. 🙂 Maybe the new year will bring a little more time to myself! Let me try to summarize our educational melodrama of the past few months before I get into the science lesson we did today… So when we realized we’d be moving to Seattle for a year I decided we would homeschool BB for his kindergarten year. Everyone was more or less on board with this plan. We had good reasons: public schools here are mixed, with some being very good and some being pretty bad. Where we were looking to rent, it was pretty bad. Private school is too expensive, and hard to get into, as a latecomer. But we ended up renting in a totally different part of the city than anticipated, and our local school seemed pretty OK. (By that I mean a 5/10 on greatschools.com. Pretty average.). I was still set to homeschool. It was gonna be awesome! 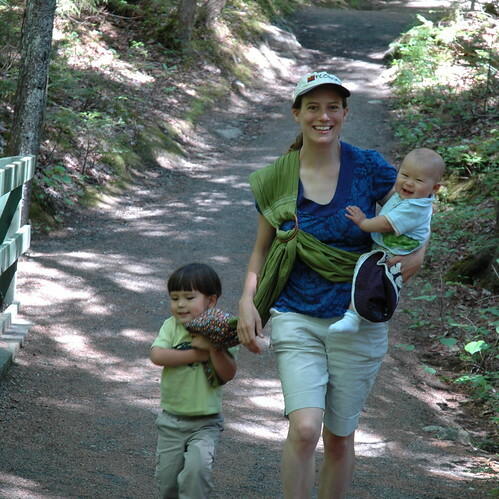 Exploring the museums, parks, and beautiful surroundings of the puget sound area. Learning about volcanoes and killer whales. 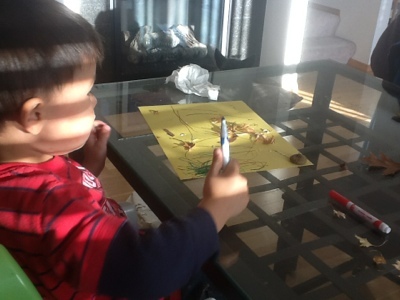 But…as the summer came to a close, BB started asking about where he was going to kindergarten and when did it start, and it occurred to me that he was either not understanding my awesome plan or not on board with it. So I hastily enrolled him in SPS. And crossed my fingers it would be ok. Here, they have full day K, but you have to pay for it (crazy, right?). So school started, he was excited, then less excited, then nervous, and on day 4 a sobbing mess of a child, begging me not to leave him there. Hmmmmm. I made a deal that I’d come get him at lunchtime. He was ok with that. Since then, we have dropped to half day officially, which saves us quite a bit of $$$ and seems to be a better amount of time for him to be at school. And now I have him at home in the afternoons, and while LB naps, we work on the lessons he is missing by not going full day. I purchased curricula for handwriting, math, and science, the last one being Nancy Larson Science. The reviews were great, and BB was excited about it but his enthusiasm has faded a little. We are just on lesson 5 so I don’t want to review the whole thing, but I’ll say the early lessons were too easy for him. There were 3 lessons about naming the parts of the body, easy names, like hand and head, etc. I was supposed to draw a body and highlight the parts we were naming. 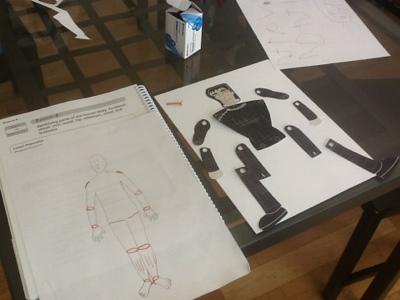 Neither one of us wanted a third day of this, so for kicks I printed out Frankenstein’s monster and we assembled him as we named his joints and other parts. This little monster shows joints well, because they really move, and you can pose him in different ways. Then because LB was with us (no nap today!) we all played the scripted game of Simon says. It was a LOT more fun with 2 kids! Here is where I found the monster printable. They have a bunch and it’s a fun activity in and of itself, plus a fun way to go over shoulders, elbows, etc., since the joints are articulated using brass brads. Looks more fun than the body drawing, eh? LB wanted me to take a picture of him doing his “work” too. At this point, I like the science curriculum although I see it as a little too basic. As a former high school science teacher, I wanted to guard against my own tendency to speak over a 5 year old’s head. I think this will work out for us, with me adding a little more of a challenge, or adapting it to be more fun somehow. For now, this is our life; a little less crafting for me (ok, a lot less crafting, my machines are still in boxes!) 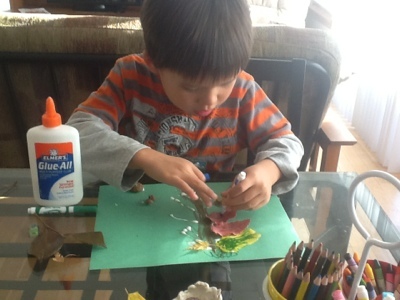 and more educational, homeschoolish type crafts. My goal for October is to make a new purse, though,because my dream purse is in tatters! Wow, it’s been a long time! You know, I follow several blogs and I’m always amazed to read things like, “Guess what, I just had a baby! Now I will only be posting 3 times a week instead of 5” or “Sorry this is a day late! We just moved cross country and I am posting from my phone.”. Well, this summer we moved cross country. It wasn’t the kind of thing that set me back a day, it was the kind of thing that turned our whole world upside down. We’ve gone from the suburbs of upstate NY to the city of Seattle, from a house with a yard to a townhouse with no yard, just a view of an alley and an adult video store. Classy! BB has started kindergarten, which has been a HUGE adjustment for us all. More on that another day! LB is going to a great little Spanish immersion preschool. He came home yesterday and told me, “Hoy es Martes!”. I was so proud! So, this is all to say that we are finally settling into a routine and hitting our stride in a new place. Fall has been beautiful, and today I finally kind of got my act together, thanks to a great morning at MOPS, which I haven’t done before but really enjoyed, and found very encouraging. They talked about the five love languages for kids and it really reminded me that the kids both love doing crafts, which I have slacked off doing since we moved here. So today when we went walking to BB’s martial arts class, we gathered leaves, acorns and chestnuts. 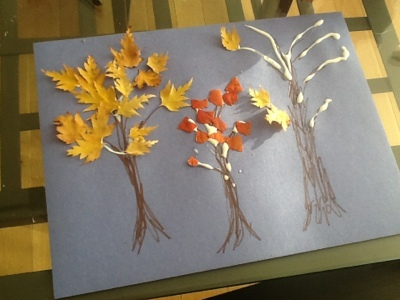 We made a little fall foliage collage… No directions from me beyond drawing a tree trunk and gluing stuff on. They love gluing stuff! The kids each did their own thing! 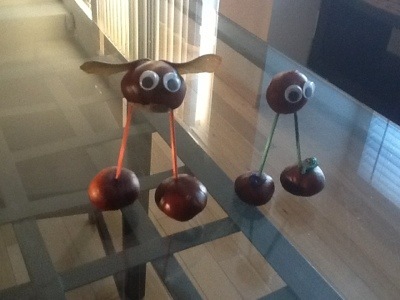 Then we made some cute little chestnut guys. The chestnuts were soft enough that I could just shove in toothpicks. We used fast grab tacky craft glue for this project. Cute, aren’t they? Well, I’m going to try posting this before it gets too long. I just realized I could do this on my iPad (so please excuse odd punctuation, it has it’s own ideas sometimes), which is super convenient if it works. You can expect more posts if this works out! Well, I did it! 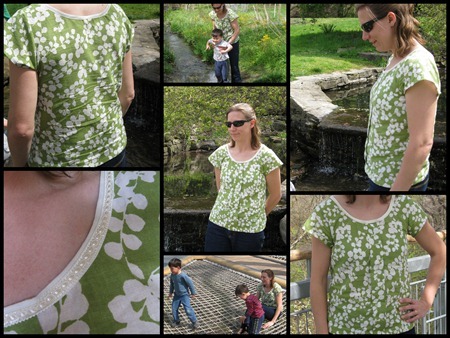 I finished spring top #3 before the deadline of 8 p.m. tonight. 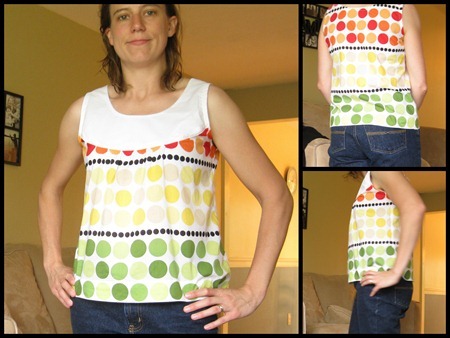 Of course, today is gray and rainy, so the pictures are not the best, but what really matters is making a top that I think is super cute, and pulling off some pattern alterations that make this latest Sorbetto completely different from my first two Sorbettos. 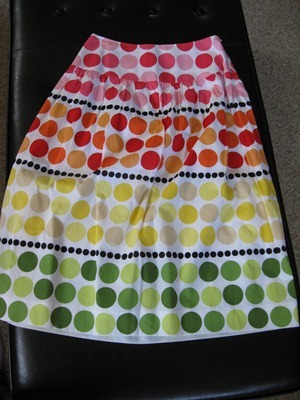 Like I mentioned last time, I thought this fabric would look cute in a Simplicity pattern that I have, but it’s in storage, so I can’t even tell you the number! Necessity is the mother of invention, so what I did was cut a yoke off the Sorbetto, remove the pleat from that piece, and add 1/2” seam allowance at my new seam. Then for the bottom front piece, I gathered the extra fabric across the middle half, choosing endpoints that I thought looked good. I ended up omitting the dart because the fabric is really thin and I thought the dart would show through to the right side, plus with the gathers here, it is sort of unnecessary. 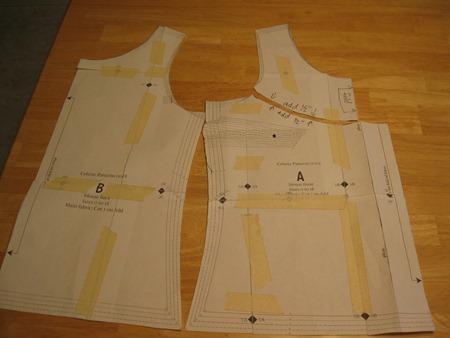 I mention this because it meant that my armholes did not line up; if you try this, omit the dart from the pattern before you cut the fabric! 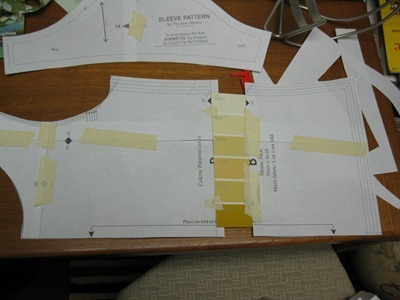 Finish the neck seam on the back piece with bias facing. 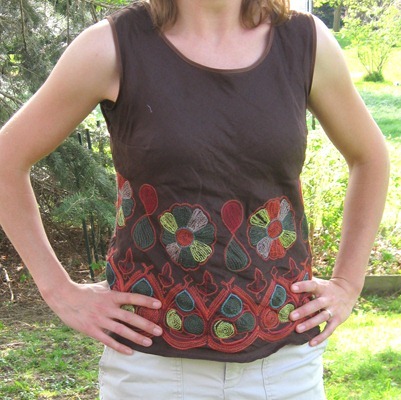 Cut 2 yoke pieces and sew them together at the neckline, right sides together. Turn inside out and press. 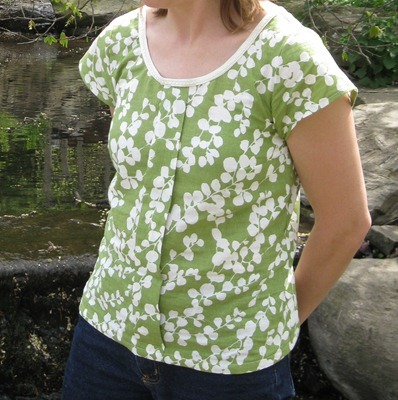 Optionally, stitch the seam down to the back side; this keeps it in place and makes the neckline lie flat. Sandwich the shoulder seam of the back piece between the 2 pieces of the yoke, right sides together. This is spatial reasoning at its finest. When turned right side, out, the whole seam is enclosed; it’s the awesomest seam finish ever. It’s really hard to describe it; I wish I’d taken a picture! Gather the lower front piece to fit the yoke. 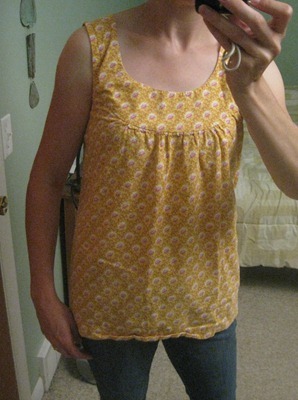 Match RST with the front piece of the yoke and sew. Press the back side of the yoke under 1/2” so it will sandwich the seam you just made. Pin in place and topstitch from the front, making sure to catch the back piece also, and making sure the seam is pressed upward so it becomes enclosed. Sew side seams and it’s done! Although you can’t see it in the pictures, the cool thing about this shirt is the way there are no exposed seams anywhere, except the sides. Well-finished seams make for a really professional-looking garment! You can’t see it when it’s being worn, but as the wearer, you notice it every time you put it on. It’s not a fitted style of shirt, but this fabric is so breezy that I think it makes for a nicely draped top. This fabric is so lightweight it is like wearing nothing at all. The total opposite of my sackcloth linen shirt! It will be perfect for those hot summer days we get here in Rochest…wait. We don’t really get any. But it’ll be perfect for those steamy Seatt…no. Not there either. Good thing it looks nice with a cardigan! Please excuse the freshly showered look… this is what happens when you wait till the last minute! We’re back at home now, in the land of neat and tidy living. 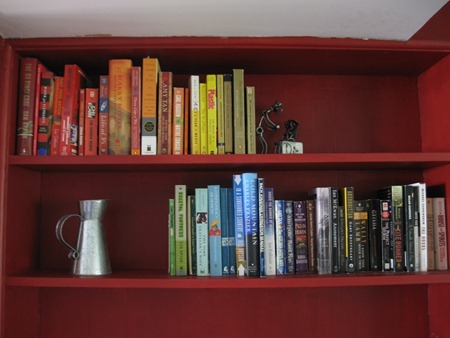 Here where I have done ridiculous things like line my books up by color. I saw it online, and it looks pretty, right? Normally I have a library-esque system where fiction is on one side and non-fiction, grouped by subject, on the other side. But as they say, the way you show a house is not the way you live in it. So true! This is not me at all but I have to admit I kind of like it. Anyway, back up in NY we have thrift shops on every corner, a luxury (haha! just saw the irony there) that doesn’t exist down where my parents are. So, needing shoes for BB and still having the sewing bug (sewing really begets more sewing), I looked around the shop while the boys played with cars. 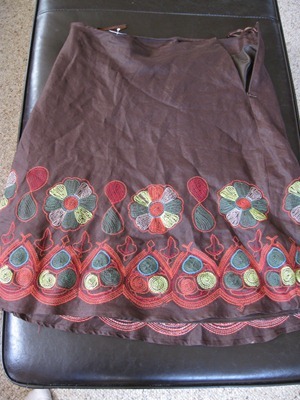 I didn’t find any good tops to refashion but I did find this skirt that really called out to me; it’s linen, which as I mentioned last time I am very fond of, and it had this funky embroidery. 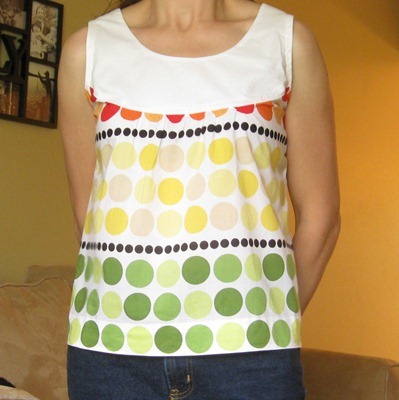 Now, when cut apart and pressed it was barely, barely big enough to fit the pattern, again the Colette Sorbetto, without the length added (which was OK because it already has a hem), and without the pleat. I cut it out and put it together and found it surprisingly baggy. I guess this fabric is quite a bit stiffer than the last one so it didn’t drape at all, just stuck out like a big hoop skirt. I ended up taking the sides in about 0.5” each and adding a seam in the back, about 0.5” at the top and increasing to about 2” at the bottom, so a pretty substantial modification. This closed up both the neck and arm openings, so instead of doing a bias facing, which eats up 1/4”, I pressed my tape to be a double fold bias and applied it to the openings that way. No hope of eking out sleeves this time! I am really happy with the final product though. It was unfortunate because this is a really noticeable pattern to stick a seam into! But it had to be done. Now, the skirt this came from was fully lined, and after wearing this I can see why – it is super, duper, mega scratchy. I had a linen blend sling awhile back that eventually gave way to softness and I hope it happens for this fabric too, because right now I kind of feel like some medieval peasant wearing a burlap sack (albeit a pretty one). The skirt was dry clean only but I hand-washed it and I think I will take my chances with the washer and dryer in the hopes that the fibers can be scrubbed and spun into submission. The #1 in the title is because I found another skirt, which is now cut apart and pressed and ready to be made into a shirt. …but it’s IN STORAGE! Boo! So it will probably become yet another Sorbetto, which is fine. 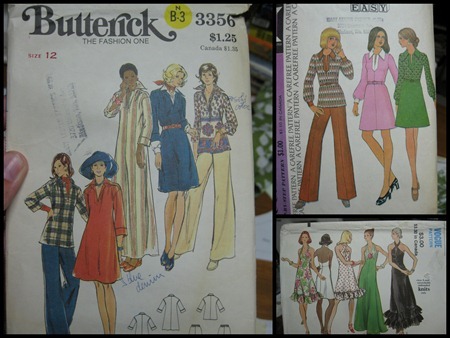 With all the possible variations (sleeves/sleeveless, pleat/no pleat/inverted pleat, etc.) plus the wildly different fabrics, it won’t end up looking like 3 of the same top, which is one of the best features of the pattern. It’s a blank slate! So, if I find the time, top #3 here I come! Don’t forget to check out all the fun stuff going on in the spring top sewalong! I really like the shirt. I’ve made several closure-less tops from wovens and it’s a well known fact that these are a little bit on the baggy side. In order to be a pullover-type top instead of a button/zip style top, they need a good bit of ease. I made a size 8 (my measurements ranged from size 6 in one part to 12 in another, so I just picked my RTW size and hoped for the best), and the sleeve pattern fit perfectly with it. The shirt is a little baggy compared to a t-shirt, but it’s not the tent that I was worried it might be. It is super comfy compared to the other woven shirts I’ve made. 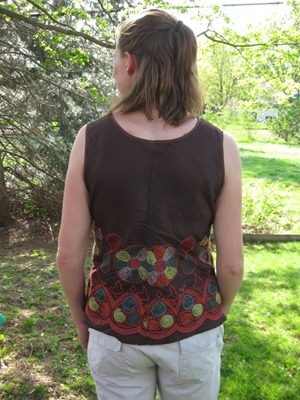 The armholes are not binding and there is plenty of room across the shoulders to move. I did decide to lengthen it, based on some comments I’d read, and I did this very scientifically by adding a paint chip where the pattern pieces joined, haha! I did this front and back to ensure they would be the same size. I hate shirts that are too short and this one is not, with a bit added in. Oh, I also shortened the bust darts by about an inch, since they seemed long. No picture of that, but you can be assured it was equally scientific. That’s just how I roll. I wore it all day today and was just in love. It does get wrinkly, which I consider an endearing characteristic of linen more than a problem. I was able to chase kids all over and I didn’t feel it was tight, or gaping, for that matter, and I love the softness and breathability of linen. 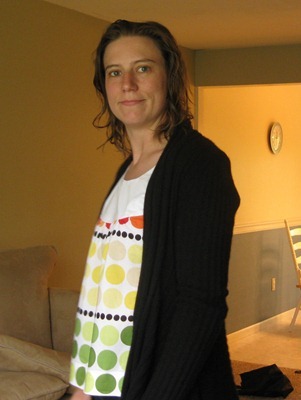 On the neckline, I didn’t like the way the bias tape looked (neither did either of my critics), so I covered it with a cute trim that I picked up at Joann while I was fabric shopping without the kids (oh, the luxury!). You can see it in the bottom left picture below. It doesn’t show up in the other pictures but I think it adds a great touch to the shirt. Too bad I am not bold enough to try the really retro look!